Mixing paint to get the right colours in the right quantity is a fun way for pupils to practise ratio. We have used the styles of various famous artists as well as giving pupils the opportunity to mix the paint for their own masterpiece. A great combination of Maths and Art.Learning Outcomes: Pupils will be able to work out the ratio of colours that are needed to make a specific colour. This game has been devised to help students to memorise the characters and the plot of the Greek myth “Perseus and the Gorgon”. 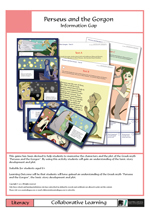 By using this activity students will gain an understanding of the basic story development and plot.Learning Outcomes: Students will have gained an understanding of the Greek myth “Perseus and the Gorgon”, the basic story development and plot. Planets hold a fascination for many children and we have built on this interest to improve children's speaking and listening skills, as well as their ability to cooperate. 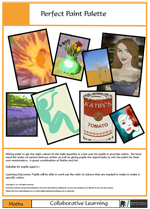 Learning Outcomes: Pupils will be able to name and knowledge of some of their basic characteristics. 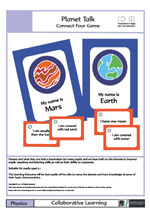 The Planets Matching Game allows pupils to build on their knowledge of the planets as well as improve their speaking and listening skills.Learning Outcomes: Pupils will have increased their knowledge about the planets. Classification is very important in all the sciences. 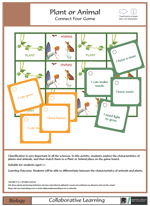 In this activity, students explore the characteristics of plants and animals, and then match them to a Plant or Animal place on the game board. You can add pictures or characteristics to the blank Game Cards. 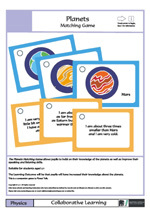 You may wish to add versions of the Game Cards in different languages, to support children new to English.Learning Outcomes: Students will be able to differentiate between the characteristics of animals and plants. 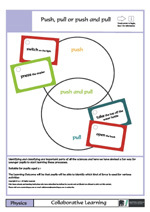 This game has been devised to help pupils to understand the process of plural creation in a fun way and also to expand their vocabulary and improve their spelling.Learning Outcomes: Pupils will be more familiar with plurals and will be able to demonstrate this by giving examples. In daily life we are always working out the probability of certain events happening or not. 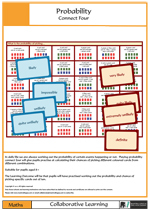 Playing probability connect four will give pupils practise as calculating their chances of picking different coloured cards from different combinations.Learning Outcomes: Pupils will have practised working out the probability and chance of picking specific cards out of ten. 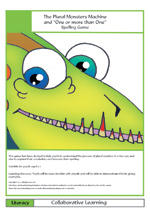 Identifying and classifying are important parts of all the sciences and here we have devised a fun way for younger children to start learning these processes. If you add different sets of cards please send them to the address below for expanding our library.Learning Outcomes: Pupils will be able to identify which kind of force is used for various activities. Sorting and classifying are important parts of science and in this activity we have concentrated on the different physical qualities of everyday objects. 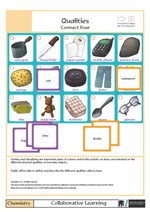 If you add different sets of object pictures or translate the game into different languages please send them to the address below for expanding our library.Learning Outcomes: Pupils will be able to define and describe the different qualities objects have. Food poisoning can make people very ill or even kill them, so it is important for students to learn food hygiene. 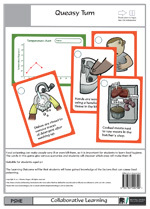 The cards in this game give various scenarios and students will discover which ones will make them ill. Learning Outcomes: students will have gained knowledge of the factors that can cause food poisoning.